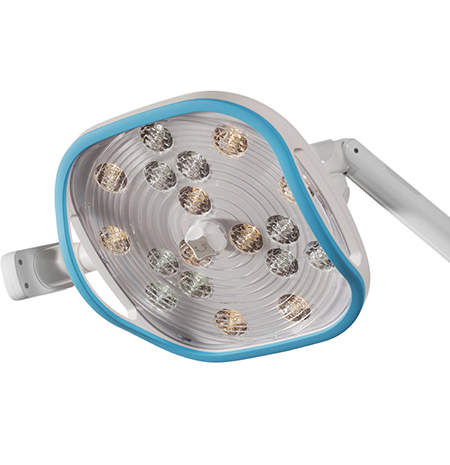 Urania, Lynx and Aster-Plus medical lamps, in light of LED technology, assure excellent performances (neutral light beam at 5,400 K, CRI of 80, maximum brightness of 40,000 lux) long lasting cycle life (50,000 hours) and at the same time low using costs (from 12 to 14 W). In light of LED technology, furthermore, it is not perceived any temperature coming from the lamps that work silently and without the fan. Designed, engineered and manufactured by Calzavara, Urania is a lamp which inherits a wealth of knowledge in the field of light technology over [the last] twenty years. The Italian design combines aesthetics with the installation flexibility, user friendliness and ease of cleaning. 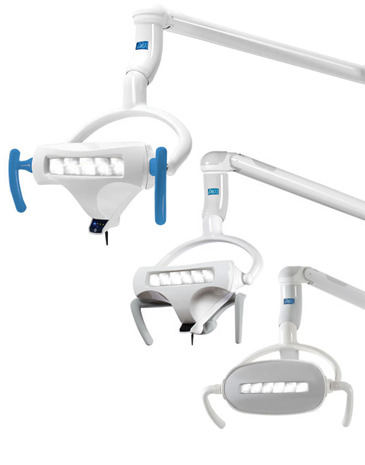 The ergonomics of the new handle, [which is] easily removable and autoclave sterilizable, integrates the lamp body rotation system on three axes, ensuring precise, fast and light movements in every situation. Smooth surfaces, high strength plastics, and the powder-coated aluminum arm offer durability and ease of cleaning with common detergents. Lynx is the lamp for the most demanding professional. Its innovative design is characterized also by an ergonomic handle with smooth and sinuous lines. Used materials assure long lasting endurance and easy cleaning, moreover they are in compliance with the hygiene standards request by medical sector. Aster-Plus, an evolution of the aster model, continue to be an excellent compromise between quality and price. Its mechanical parts of the arms and the plastics of the heads, even more robust, are designed to assure improved reliability with the same degree of lightness. Lamp is characterized by a brand new handle even more robust and ergonomic. Thanks to an innovative system of lenses with 18 LED light sources, Iride provides a beam of light with wide scialytic effect, shadow-free, configurable with two different patterns from 18 to 30 cm in diameter. The light emitted by Iride is white and natural, with a CRI (Ra) of 90 points and a maximum brightness of 60,000 lx, which does not strain the eye and does not detract from operator concentration.